2. 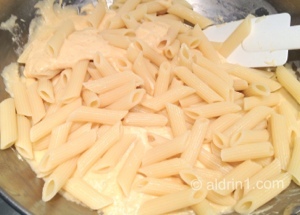 Cook the penne 2 minutes less than what the package instructions calls for (it will finish cooking later in the oven). Rinse the pasta in cold water and drain well. 3. 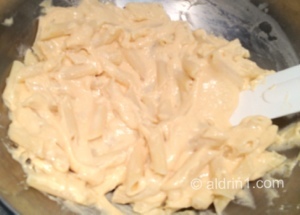 While the pasta is cooking, you may start preparing the sauce: Melt the butter in a heavy-bottomed saucepan over medium heat and whisk in the flour. Continue whisking and cook for 2 minutes. 4. Slowly add the milk, whisking constantly. Cook until the sauce thickens, about 5 to 10 minutes, stirring frequently. 5. Remove the sauce from the heat. Add the cheese, salt, chili powder (and paprika if using) and garlic powder. 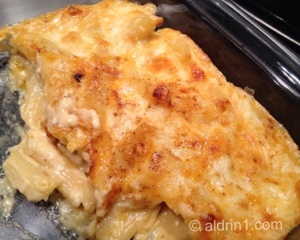 Stir until the cheese is melted and all the ingredients are incorporated, about 2 to 3 minutes. Set aside. 6. Add the pasta into the sauce and carefully mix well. 7. Butter or oil an 8-inch baking dish. 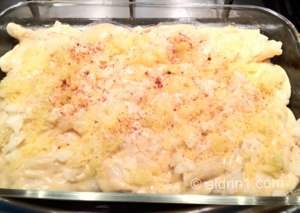 Scrape the pasta into the baking dish. Sprinkle the top evenly with the additional cheese followed by the chili powder (and paprika, if using). 8. Bake, uncovered, for 20 minutes. 9. Let stand for 5 minutes before serving. Have you ever ate the original “World’s Best” Mac & Cheese at Beecher’s Handmade Cheese (the original Beecher’s in Seattle and they now have one in New York)? Thanks! I’ve been quiet lately as I’ve been quite busy with my day job to try out new recipes & to post their results here. Buy I’ll try to add new posts soon.